Indentification of this design as number 117 is original to Rakusan who designated this woodblock print as the 117th design published in his main sequence. However, 117 is actually the seventeenth of thirty-six woodblock prints in Rakusan's second main sequence series, 篁子生画選, Koushisei Gasen, lit. 'Koushisei's Print Selection' (usually called here the 36 Series). The woodblock print of 117 was adapted from an actual-size original painting on silk. All of the original prototype paintings for this series are currently in a single private collection. Like most 36 Series designs 117 has the same signature and seal combination on every copy. Therefore, for 117 only a single extended edition I (which includes reprintings both before and after World War II) can be distinguished. It is usually only possible to date an individual loose print of 117 with edition I markings by listing approximate potential ranges of 1934-1941 and 1948-1955. 117 is one of several designs Rakusan printed using different colors and techniques within the same edition. Almost all known copies of 117 are one of two distinct color morphs 117 (a) and 117 (b). The copies illustrated above are typical examples of each of these color morphs and come from dated sales only a few months apart in 1935-1936. Both illustrated copies are in the same pristine condition in the same private collection and were photographed at the same time and in the same way. The 117 (a) morph is characterized by darker, more saturated hues - hot pinks and chartreuse greens. The 117 (b) morph is paler and less vibrant with instead mauve pinks and jade greens. It is important to emphasize that the color differences are original and deliberate, and that examples of 117 (b) are not just faded copies of 117 (a). The colors in the original painting on silk 117-0 differ from those in both morphs, but especially in the greens most closely resemble those of the 117 (a) morph. Currently, more than twice as many copies of 117 (b) have been documented compared to the numbers of 117 (a). There are a few isolated examples which may represent additional morphs, but their condition is suspect and their original colors may have altered. The earliest 36 Series prints were delivered tipped into recessed wells of presentation sheets embossed in their lower margins with the series title. Because all early edition I prints once had these presentation sheets, a copy which retains its presentation sheet must have been printed during the 1930s. (Both of the illustrated copies of 117 (a) and 117 (b) are on presentation sheets.) After his supply of presentation sheets was exhausted, Rakusan distributed subsequently-reprinted copies loose. A limited number of leftover earlier-printed copies of some designs on presentation sheets were still being distributed shortly after World War II, but by then most designs were only available as loose sheets. However, absence of presentation sheets is not diagnostic of later printings because many early prints have subsequently been detached from theirs. The Rakusan project which produced 篁子生画選, Koushisei Gasen, resulted in two related series of woodblock prints. Each print of the 36 Series is intimately connected to a group of prints with the same subjects in the Fan Series. Together these subject-related prints in the two series constitute a theme. Each theme consists of a quintet of monochrome Fan Series designs (one design in each of the five fan shapes), plus one polychrome, 36 Series design which illustrates the theme subject. The theme is labeled here by the original Rakusan number of its 36 Series design followed by the subject. 117 is the 36 Series design of the 117 Tree-peony theme. The 117 Tree-peony theme is one of the many entirely regular themes represented by a complete fan quintet and a color woodblock print. The 36 Series design 117 and four of its five Fan Series designs have seal C which indicates that they were created and carved in the seal C period between the last months of 1933 and the end of the first quarter of 1934. However, the final Fan Series design was not added until somewhat closer to the time of publication. The Fan Series designs of the 117 Winter Tree-peony theme were printed during September 1934 and were distributed September 15, 1934 as installment six (of twelve). On the delivery documents Rakusan used the theme subject title 寒牡丹, kanbotan, 'winter tree-peony', which is also the original title of 36 Series design 117 published at the same time. Earlier in the 36 Series Rakusan had created another tree-peony theme. That earlier 103 Tree-peony theme is also perfectly regular in arrangement and content, but each of those designs bears early signature and seal markings. 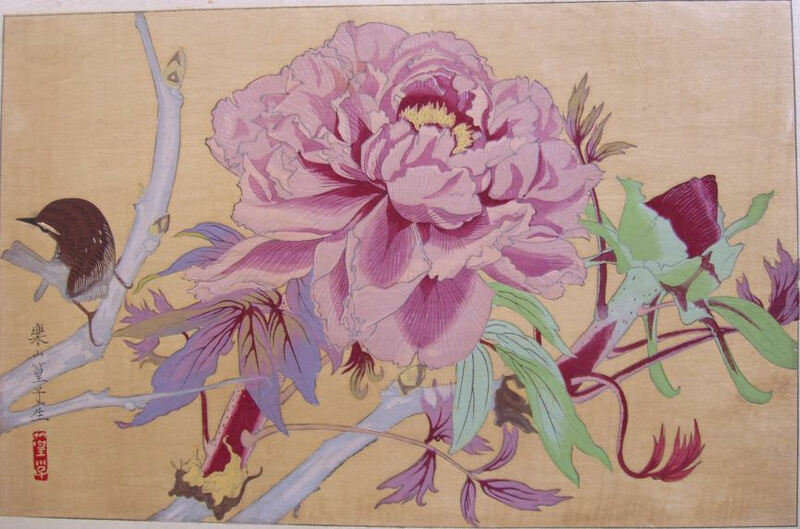 The designs in the two tree-peony themes also differ in execution with the petals in the 117 Tree-peony theme filled with scribed parallel lines, and those in the 103 Tree-peony theme more silhouette-like. 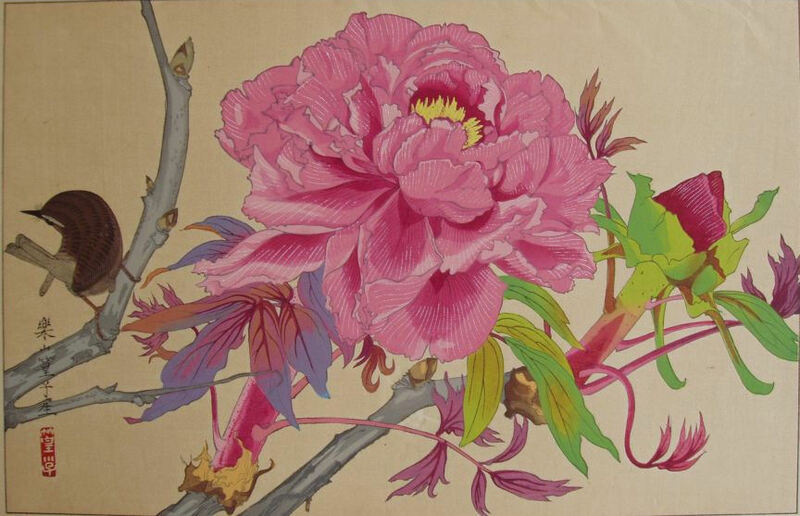 The 103 Tree-peony theme represents a separate earlier addition to the series which (apart from its shared subject) is entirely distinct from the 117 Tree-peony theme. The pairing of the wren with the winter-blooming tree-peony is a traditional Japanese symbol of the winter season. It was also one of Rakusan's favorite subjects and he illustrated it in at least five surviving designs. The pairing occurs here not only in 117, but also in 117-5, 11alt, and 11. Eurasian House Wren (or Winter Wren), Trogolodytes troglodytes, 鷦鷯, ミソサザイ, misosazai, is a year-round resident in Japan.